Welcome to another Polkadoodle challenge! If you've not already had a look at our two (yes two!) Design Team calls then have a look at this post here, but be quick - Flat Friends ends today (31 August) but the Polkadoodle call is open until 19 September. And if that is not enough excitement, you can catch the launch of the brand new Picknix Collection - Gingerbread Twist with Nikky on Saturday at 10am and 4pm on Create and Craft. And with a name like Gingerbread Twist, I bet you can't guess what theme it will be!!! Congratulations to you all! Eva's Scraproom please email Nikky for your prize and you can all grab your blinkies from the sidebar. Please remember to put your verification code and the challenge week in the subject field on your email. For all prize winners, you must use the code given above to claim your prize otherwise we cannot release it. This week the challenge theme is FLOWERS and the closing date for entries is Sunday 9 September at 12noon GMT. Ruth: I've gone for an old favourite - Paper Boutique Vol 1, cut out all the different flowers and layered them up how I wanted. I've added stickles to the edges of the petals plus seed beads for the centres. I've also added some ribbon from my stash and die cut letters and numbers. Norine - This was a fun card to make, printing the digi and then paper piecing as well as Copic coloring! 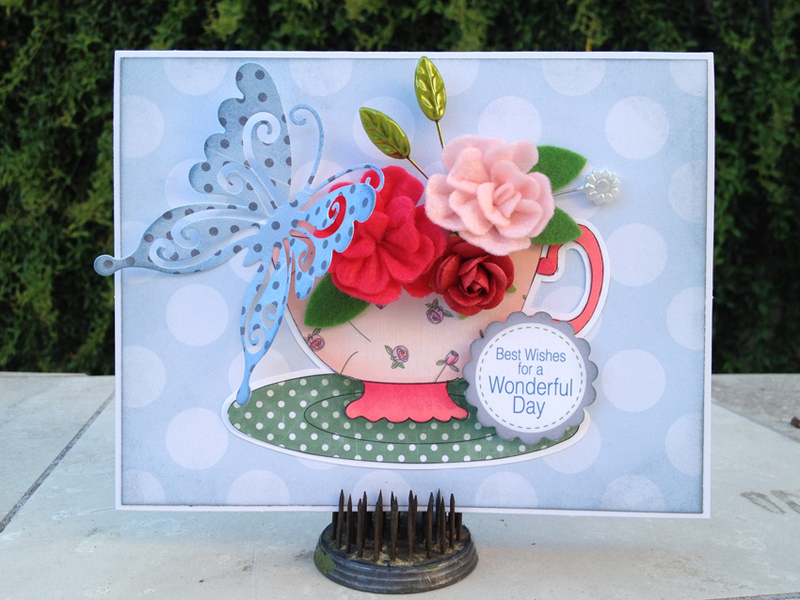 The papers and teacup image are from the Sugarplum Daisy cd and the butterfly is a Marianne's die. The sentiment is from the Pretty Tuff cd and punched with a Fiskars scallop punch. Prima flowers and Maya Road pins from my stash. Shary - I've made an Xmas card incorporating some flowers. I've used papers, sentiment and image from the brand new Here Comes Christmas CD. I've used the Marianne Designs Snowflake Circle to frame the image. 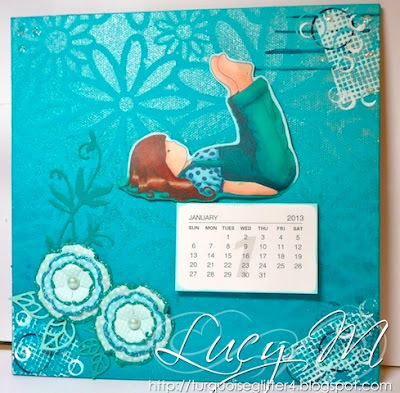 Lucy ~ This week I decided to make a calendar for my ma. The background is painted but the digi image is from the Pretty Sweet CD Rom. Coloured with Pro Markers & Flexi Markers. The flowers were made using papers from the Sugarplum Daisy CD Rom, cut out using Marianne Design Creatables as was the swirl design. Miria I made a quick card printing and cutting out these gorgeous flowers from cd Candy Doodles collectors edition and use a paper and sentiment from the same collection, the birdcage is a Marianne Design die. I just added a ribbon and halfpearls as a final touch. Clare - This week I have made a card using the Here Comes Christmas CD. I have decorated the card inside and out and layered the images. I have used the pretty Marianne poinsettia dies and layered them using Bazzill cardstock. I have used Red Berry Doodle Dew drops to the centre of the poinsettia. Finally for the inside I have used Spellbinders Labels One Nestability and a peel off from my stash. Good luck with the challenge - closing date is Sunday 9 September at 12noon GMT and don't forget our rules! 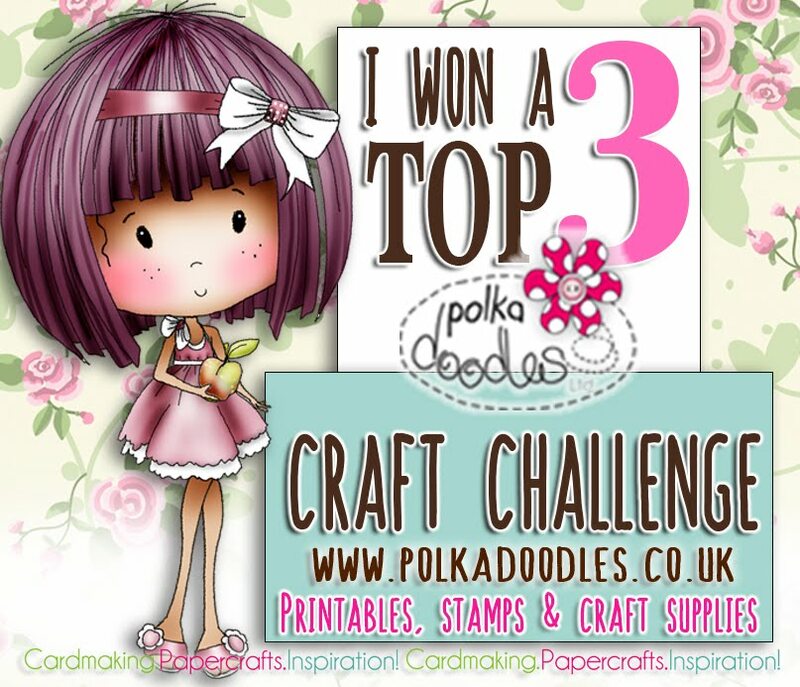 Hello folks, Friday is here yet again so it's time for a new challenge here on Polka Doodles. Your hostess this week is Shell and her chosen theme is STITCHING which can either be Real or Faux - the choice is yours! Don't forget that we have 2 DT calls going on at the moment and all the details can be found HERE so if you're up for a challenge, why not take a look and maybe give it a go as you know what they say - you have to be in it to win it so to speak! We are looking for a new teamie on this Polkadoodles team and also on our new Emma Canning team, so it's an exciting call! Congratulations to you all! Please all email Nikky for your prizes and you can all grab your blinkies from the sidebar. Please remember to put your verification code and the challenge week in the subject field on your email. For all prize winners, you must use the code given above to claim your prize otherwise we cannot release it. And now for your inspiration which I'm sure you'll agree is fabulous and just what you need to get those creative juices flowing! Fabiola- I love sewing on my cards, this time around for my project I have done some faux stitch behind the awesome image. The image is Summer Thank you by Emma Canning. The sentiment is from the Pretty Sweet CD Mini Collection which is an awesome collection. The papers are from the Studio 12 Picknix Collection CD , and I went for a vintage look. NJ Hello lovelies, well this is a first for me, I have a sewing machine that has been gathering dust for years and this is the first time I have used it on a card. I have used the Pretty Sweet CD. I stitched a border around both the backing papers and coloured the image in using Promarkers. The flowers are Polkadoodles Bloomers. Lou: Happy "Bank Holiday Weekend" everyone .... or for those of us in the UK! I have used the other half of the "Mistletoe Moment" image from Emma Canning as I wanted to give him centre stage. Just adore his pose holding the mistletoe ... aaahhhh! Image coloured with Promarkers. I didn't have any green card for my background and then remembered that the "Not for Girls" CD has a great selection of Bazzill inspired plain designs, so I printed the green I wanted, embossed with a Timmy folder. I cut out my own hearts and layered some of the embossed elements on the heart. Recreated some mistletoe and used STITCHED ribbon to dangle all my bits. Claire (Happy Days) - Good morning folks. For my card this week I've used Emma Canning's stunning Angel who has been coloured with Promarkers and Sakura Gel Pens. I've faux stitched the edges of all of my papers with a gold glitter pen. The gorgeous purple paper is from the Sugarplum Daisy CD and the lilac paper is from the Candy Doodles CD which has been embossed before swiping with DI. To finish I've used Doodle Dewdrops (I bought the clear ones and applied some gold paint to the base of them - I'm really pleased as the gold shows through brilliantly but doesn't look flat or dull). Kitty - Morning everyone! So for the challenge I decided to make a tag for a change! The image is of course one of the fabby new Emma Canning Images, this one is All Lit Up - my fav one! All the papers I used are from the latest CD Rom - Here Comes Christmas - it really is cram packed full of yummyness! JAN: I chose to stitch around all the matting and layering on my project, which gives an extra dimensional feel to the card. I have used three different background papers from the Candy Doodles CD and also die-cut a sentiment from the same CD. I used three of Emma Canning's gorgeous girls and layered them together to make a 'friends' theme, before colouring them with my Promarkers. 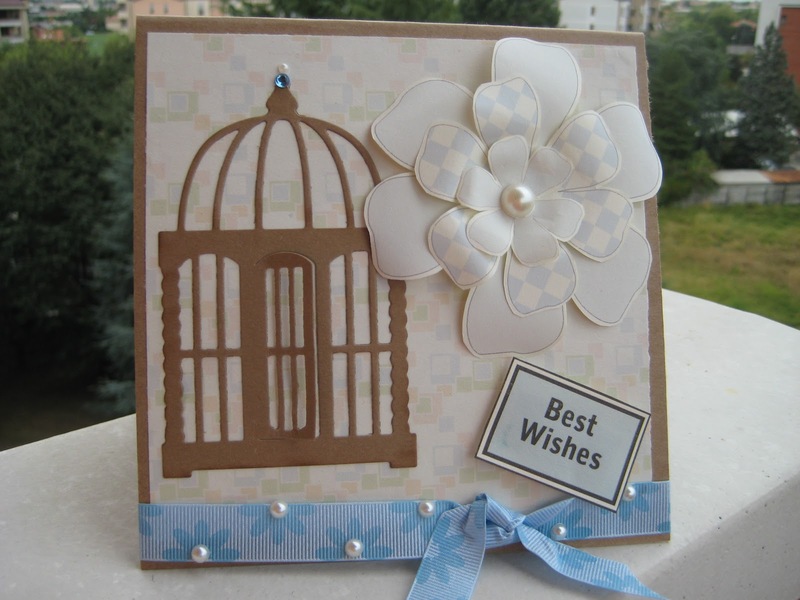 A variety of embellishments finish off the card. Shell- How typical is this, I chose this weeks challenge so I could use my sewing machine and I couldn't get it to work, so I had to do some faux stitching instead...For my card this week I have used the Studio 12 CD and the in the garden collection. The image has been coloured with copics and the sentiment is computer generated. 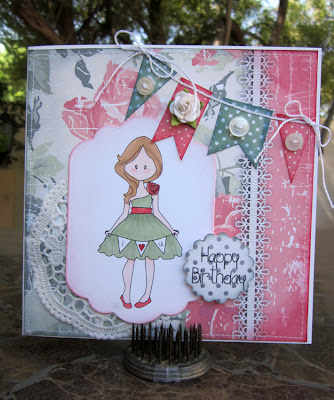 Claire: I dusted off my needle and thread this week to create my tag with the very lovely Millies Birthday image. Paper and flower from the studio 12 Cd. A little french knot attaches Millie to the tag at her waist. Emma: I made quite a simple card for the challenge using paper from the Pretty Sweet CD and a sentiment from the Sugar Birdies Collectors Edition. I distressed the edges of the sentiment and added faux stitching with a Sakura gel pen. Fliss: I had to cheat a little for my inspiration this week as my mojo seems to have been left behind since I got back from my hols lol. This is a card I made with elements and papers from the gorgeous new Here Comes Christmas CD. 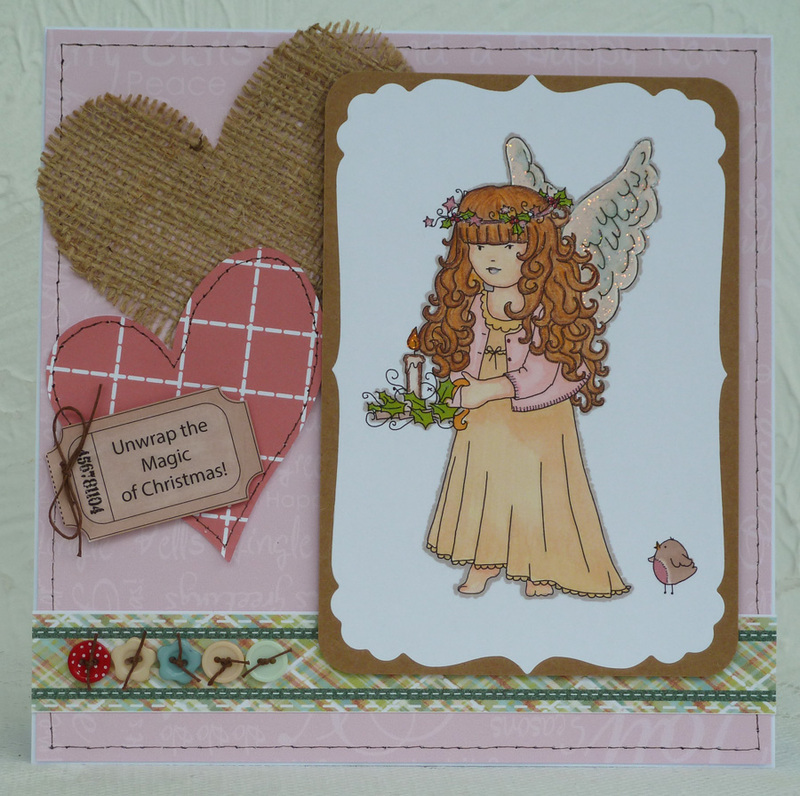 I coloured the angel with Promarkers and added layers to my card with hessian for texture. I used a piercing tool and brown fine pen to create faux stitching on the background paper and die cut heart. You have until 12 noon on Sunday 2 September to enter and good luck! Hello! !...It's time for another Polkadoodles challenge but before that, did you also know that we have news of 2 fantastic new DT calls this week? Our lovely Emma Canning is starting a brand new blog challenge and is looking for a team to help, so get on over there and get applying now, Emma's designs are a joy to work with and if you like colouring you will love it! Meantime, here at Polkadoodles we also have a new Design Team Call! Would you like to join our happy team of talented designers? 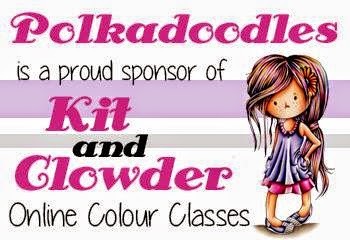 We are looking for some new blood to join us here at Polkadoodles so if you can commit to a busy DT position then apply now! This is a really exciting opportunity to join one of the UK's most popular crafting brands and have your work showcased on the UK's only dedicated Craft TV Channel! 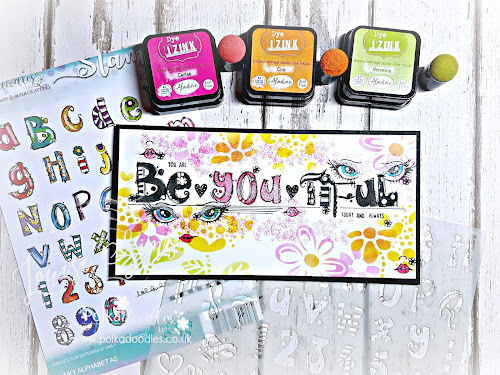 You must have a blog where you post regularly, love using digital products and stamps, love the Polkadoodle stylee of course, and be able to commit to making 2-3 projects every month and extra samples which may be shown on TV here in the UK! 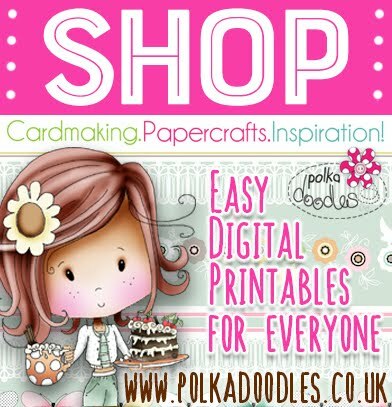 In return for your input you will receive selected products from the Polkadoodles range including digital and stamps and will be part of a fantastic team of super talented people. The term of this position is 6 months so you must be able to commit fully for that period of time. To apply: Please email here, with your full blog address and attach 3 photos of your favourite pieces of work and let us know a little bit about yourself in a couple of short sentences. All entries will be replied to by email whether successful or not, after the closing date - please do not expect a reply before this date. Closing date for applications is....19th September 2012. So, let's get onto the inspiration from Polkadoodles this week!! Firstly, let's do the winners from last time! First Place: Kevin - please use verification code PD1W3331 to claim your prize! Congratulations everyone! Kevin, please email Nikky for your prize which is a download bundle and use the code PD1W3331 in the subject field - all blinkies can be grabbed from the sidebar. Ok, now onto this week's challenge! The theme for the week is tags - so as long as we can see a tag (or two) and the rules are followed then we will be happy! Closing date for the challenge is Sunday 26 August at 12noon GMT - good luck! Ruth: This is where old meets new! 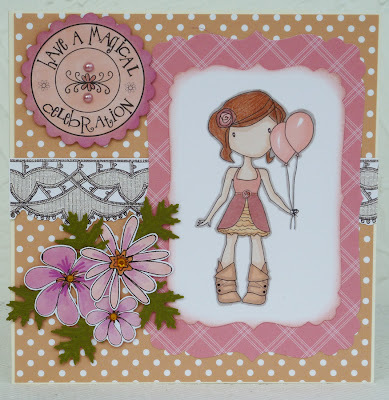 The old are papers from Candy Doodles (one of my favourites - perfect for soft light colours!) 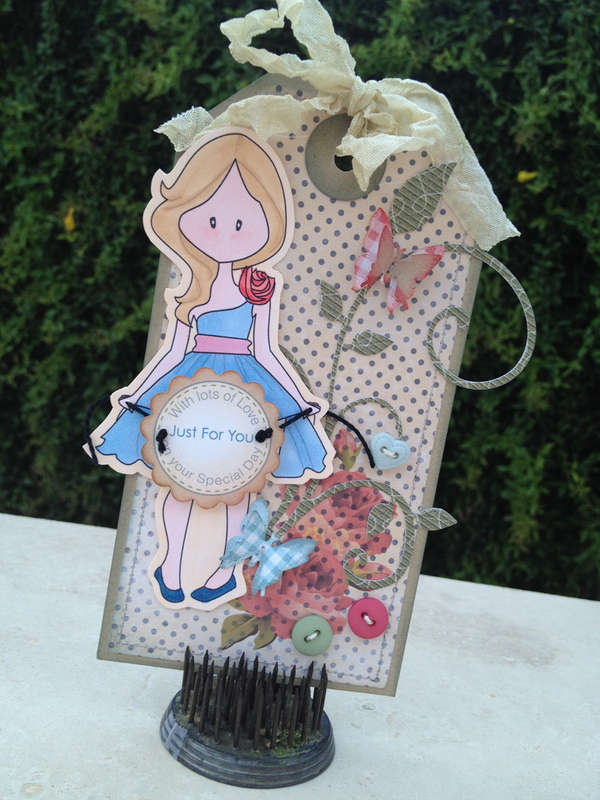 and I've used a Sizzix Super Scallop Tag die (try saying that fast!) along with ribbon left over from my cousin's Wedding earlier in the year. The new is the fab Emma Canning digi image - 'Taylor - I'm Sorry' which I have coloured with Promarkers. A bit of faux stitching and its all done! 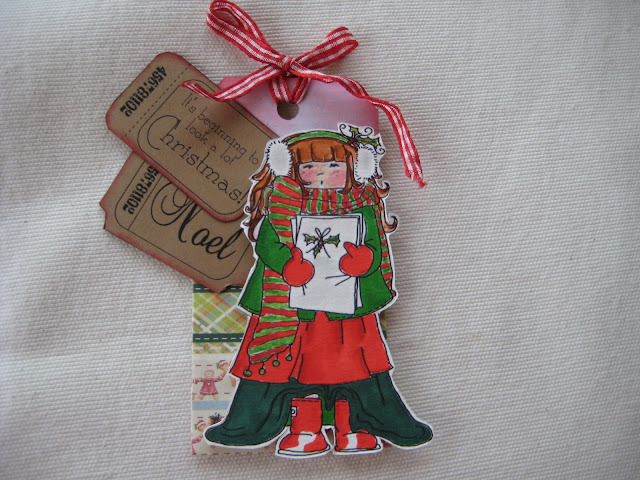 Norine - This tag is a mix of several different Polka Doodles cds as well as a lovely Emma Canning image. I ran the already printed polka dot paper (Pretty Tuff) through a second time layering the gorgeous roses from the Picknix cd over top. The vine is a die cut using Creative Christmas paper and the butterflies are punched from miscellaneous Pretty Sweet papers, as is the sentiment. Additional items from my stash are the crinkle seam binding ribbon and buttons. Shary - I've made a tag using the brand new Emma Canning image Reindeer Ride. Ive coloured it with Copics and some lace stickles. I even added a red gem to the reindeer's nose. The papers are from the Magical Winter 2 CD. I've edged them with walnut distress ink. I added some pink gingham ribbon and gems. The sentiment is from the Here Comes Christmas CD. Miria I made a Christmas tag using this lovely image from new cd Here comes Christmas, I coloured it with Kuretake Zig Kurecolor , I used some DP and tickets - I love them! - from the same cd and add just a little ribbon. Clare - I made a gift box with my tag on for Fliss' challenge. The gift box was made up using the gorgeous paper's and sentiment from the brand new Polka Doodles "Here Comes Christmas" CD. The cute Santa digital stamp on the tag is from the new Christmas downloads by Emma Canning called "Sooty Santa". I have coloured Santa with Promarkers. The tag is a woodware punch. The oval scallop is by Nellie Snellen. For Santa's hat and sleeves I have used Snow Writer and white glitter. The ribbon & embellishments are from my crafty stash. JAN: Hehe! I am gatecrashing this week because I didn't post last week due to holidays! I love making Tags so couldn't resist joining in. I have covered a plain kraft tag with purple paper from the last 'Pen and Paper Circle' CD and then subjected it to distress ink, stamping, a bit of gold embossing powder and some more stamping! I added a gold mirri heart which went through my embossing machine, topped with a little purple heart and then added a gorgeous Emma Canning image which is coloured with Promarkers to match. I recreated the little bunting banner at the top of the tag, to echo the one she is holding in the image. 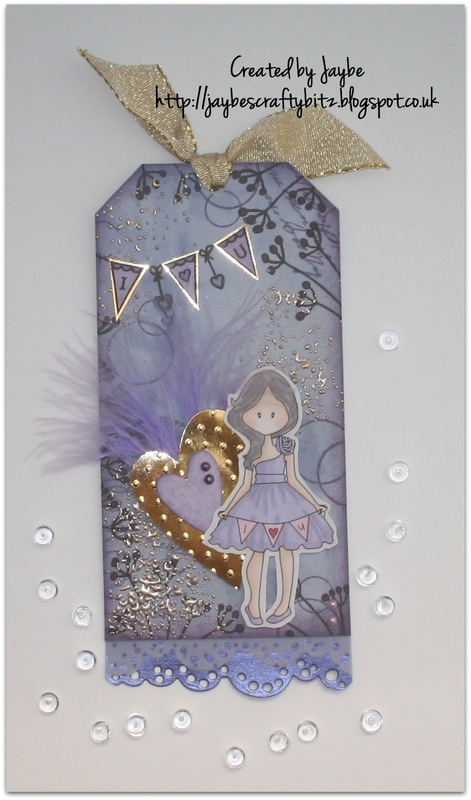 Some gold ribbon, a bit of purple feather and a die-cut lace edge finishes off the tag. Hope you like it! Anne - I've used one of the lovely Stocking Surprise from Emma Canning which I've coloured with copics. Papers and embellishments are from the new Christmas CD. Closing date for the challenge is Sunday 26 August at 12noon GMT - good luck and please remember our rules! 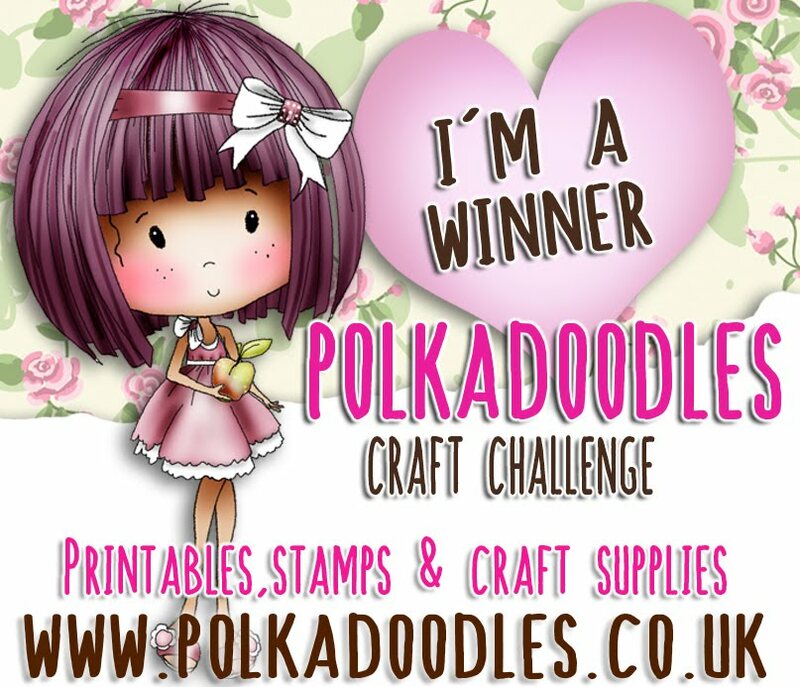 Good morning everyone and welcome to another great challenge here on Polka Doodles. Your hostess this week is NJ and her chosen theme is CELEBRATION as the end of the 2012 Olympics is looming fast and what better way is there to show appreciation of all those wonderful athletes who have made such exciting watching over the recent weeks. First Place: Marilyn- Please use verification code PD1W3230 - you win a copy of the fabulous Studio 12 Picknix CD. Congratulations to you all! Marilyn, please email Nikky for your prizes and you can all grab your blinkies from the sidebar. Now here are the Design Teams' creations which you will see celebrate a large variety of occasions - a very versatile challenge! 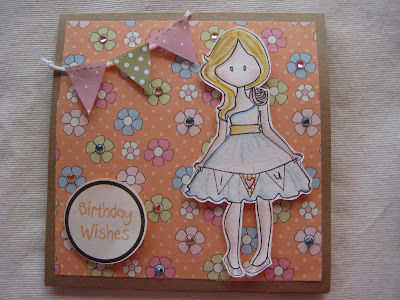 Fabiola- For this celebration I have made a birthday card. I used papers, image, and sentiment from the Pretty Sweet CD-rom mini collection. Plain and metallic papers are from my stash. Fliss - My celebration card features the gorgeous Millie Birthday digital image by Emma Canning coloured with a mix of Promarkers and Prismacolor pencils, die cut to shape and inked round the edges. 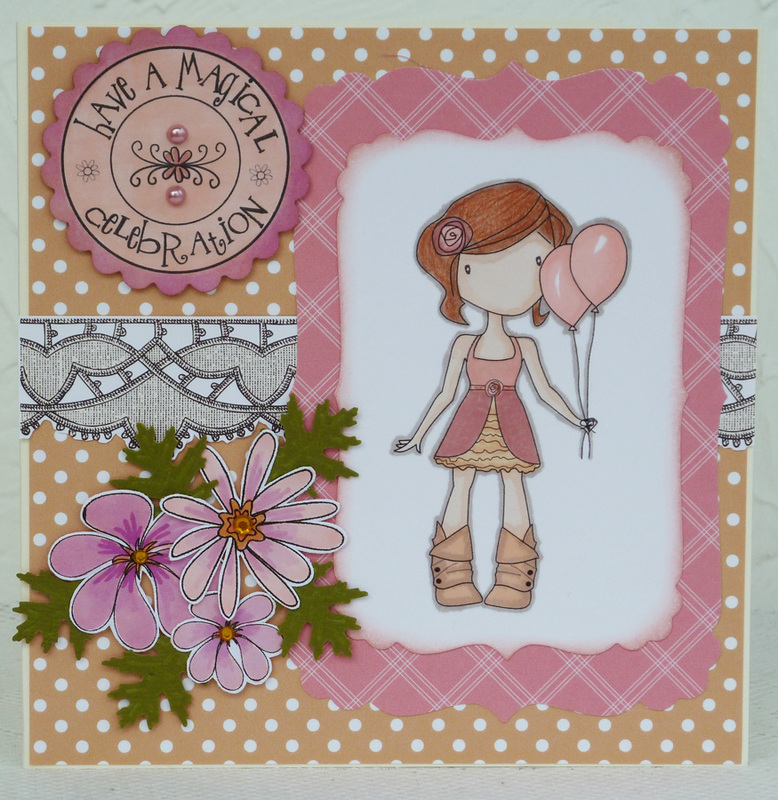 The mat is from the Sugarplum Daisy CD as is the sentiment which I die cut and coloured with Promarkers. 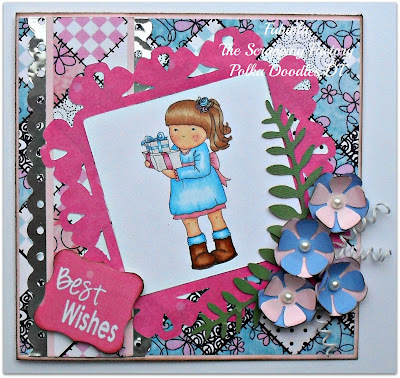 The backing paper is part of the PPC3 Kit, the flowers from Sundae of Seasons CD coloured with Promarkers and the lace border is from the Studio 12 Picknix Collection 1 CD - doesn't it all fit well together! Katrina - Hi everyone, my first ever blog post and card for Polkadoodles! I used papers and one of the girls from Pretty Sweet, together with my favourite heart paper from the Wonderland CD. I'm new to cardmaking so I struggled a bit with how to get going but I'm really pleased with the final result (and I get to steal all Nikky's stash when she's not looking!) Hope you like it too and please pop over to my blog to follow my escapades working in the office with Nikky and Kris and the rest of the DT! Nelly - To celebrate a special Birthday in the family I used the Not For Girls, definitely for men CD and decoupaged the bottle template also using the wine bottle labels for the main focal point to my card, the design papers are also taken from this CD. I used "Wade" from the Pretty Tuff CD and actually used my Tim Holz Distress markers to colour this image for the first time, maybe a little more practice required, but overall I was pretty happy with the result hee hee. NJ Hello lovelies, I wanted to celebrate how well we are doing at the Olympics. My card is a 'Well Done Team GB' Celebration. I have used Sundae of Seasons CD for this, I cut out the lanterns and threaded them with ribbon and embellished with London themed buttons. I also used a gold, silver and bronze candy to represent the medals we have won! Lou: I've cheated a little as my celebration is "Christmas". I have used one of the new Emma Canning images for my card; "Mistletoe Moment", although I have been a little cheeky and split the couple up! I have used the girl by herself for my card, coloured with promarkers and the papers are from the new "Here comes Christmas" CD.The glittery bits are from some leaves I found in a sale in January and knew they would come in handy! Red gems are those lush "Doodle Dew Drops". Shell- For my celebration card I've made a 21st birthday card for a friends daughter. 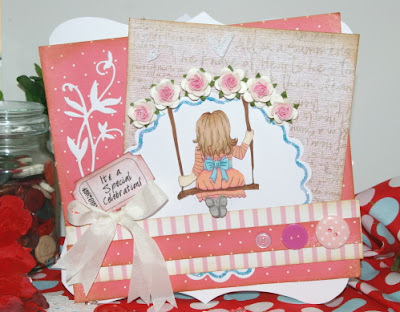 I have used papers from the Pretty Sweet CD and the image is from the Candy Doodles Collectors Edition I think the tags are also from candy doodles cd, the flowers are a marianne creatables die LR0163 I have distressed everything with Shabby Shutters distress ink. Claire I decided to celebrate all that's really scarey...lol. 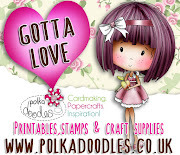 Don't you just love Franky from the fabulous Polly witchydoodles download bundle. 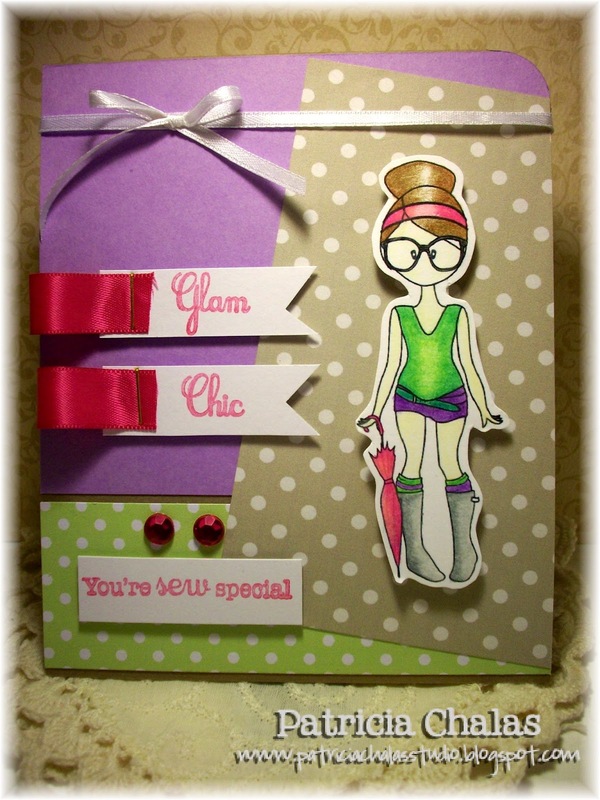 A great fun stepper card. Claire (Happy Days) - I've chosen to celebrate Christmas this week with this stepper card which has been created using the new Here Comes Christmas CD. So there you have it, some fabulous projects all bound to inspire you and we can't wait to see your entries. You have until 12 noon on Sunday 19 August to add your creations. First Place: Evelina - Please use verification code PD1W3129 - you win a copy of Paper Boutique 3! woohoo! Congratulations to you all! Evelina, please email Nikky for your prize and you can all grab your blinkies from the sidebar. Please remember to put your verification code and the challenge week in the subject field on your email. For the first prize winner, you must use the code given above to claim your prize otherwise we cannot release it. So, onto this week's challenge! The deadline is 12noon GMT on Sunday 12 August. The Winner of this challenge will receive a FREE download bundle, so get showing us your Banners and Bunting! Ruth: I've used papers from Candy Doodles and X Cut dies along with a fab Emma Canning digi - Millie Birthday (and its only £1.25 - bargain!) I've used Promarkers to colour plus a little liquid pearls. Patty: For my card I used image from Emma Canning - Taylor Camping Day and Dot papers from Sugar Birdies CD's in pastel colors lime green and light gray - add some layers of it and of top those layers Taylor Camping Day colored with Prismacolors in a bright and sweet combination of colors, and as a finished touch I added the banner with the words Glam, Chic and your sew special adorned with 2 pink rhinestones. I love the outcome of this card special since I am improving on my coloring skills!! Emma - I have made a lovely little bunting this week using the Sugar Plum Daisy Collection. Shary - I've made a card using my fav Emma Canning image called Taylor - Camping Day. She's been coloured with Copics. The papers and sentiment are from the Candy Doodles CD Rom and I've stitched and distress inked around them. Ashley- I have made a clean and simple banner card using the fabulous Picknix CD ROM. 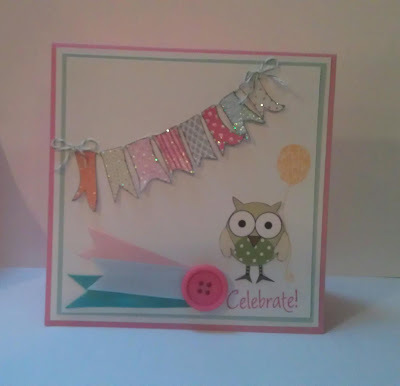 I added just glitter and an adorable owl from the Sugar Birdies CD ROM to finish it off. Miria - I made my card using a lovely Emma Canning's digi, I coloured it with Distress; paper and sentiment are from cd Candy Doodles, I used some scraps for the bunting and add rhinestones on the flowers. Anne - I've used the new Here Comes Christmas cd for my card this week. I layered the letters onto the paper before cutting our the little banners. The snowman was simply printed, cut our and stuck onto the card. Norine - I absolutely LOVED this week's challenge...I'm all about the banners and bunting these days!! And I adore the cute Emma Canning images!! The background paper is from the new Picknix cd and the banner bits are miscellaneous scraps from Pretty Sweet, and the sentiment is from Sundae of Seasons. Clare - This week I have made a rocker card and have used another lovely Emma Canning image and her name is Taylor "I'm Sorry". I have coloured her with Promarkers and covered her in Glossy Accents. The paper's are from Studio 12 Picknix Collection 1. The bunting is from a Stampin' Up punch. Ribbon, bow and buttons from my crafty stash. Daniele......I have used images and papers from the new Studio 12 Cd, layered up the bunting and lemonade stall......soooooo sweet..
Good luck with the challenge and don't forget our rules! Deadline for entries is Sunday 12 August at 12noon GMT.